The Seven Seas Cruising Association is the oldest and largest worldwide organization supporting the liveaboard cruising lifestyle. Founded in 1952 by six liveaboard couples in California and now with members worldwide, today’s SSCA remains true to the traditions of its original members—sharing cruising information, fostering camaraderie, and leaving a clean wake. The old Clipper Ship tea route from China to England was the longest trade route under sail, and included the South China Sea, the Celebes Sea, the Timor Sea, the Banda Sea, the Flores Sea, the Java Sea, and the Sulu Sea. Our name reflects the water over which those who passed before us crossed when they dropped dock lines and headed out to sea. What is an SSCA Gam? In days of olde when whaling ships encountered one another in calm seas they would heave to and the crew would line up at the railing to shout news across to one another. This was called a gam. An SSCA Gam is a get-together of members, with an emphasis on camaraderie and sharing of cruising information. What is the SSCA Clean Wake? To leave a clean wake is to show respect for others and for our environment so that those who follow in our wake will be warmly welcomed. It is our most cherished tradition. What are the benefits of SSCA membership? The Equipment Survey - a highly regarded compilation of what real cruisers are using on their boats, including failure rates and repair costs. Discounts on live webinars and anytime learning on Seven Seas University. Who can become a member of SSCA? Anyone with an interest in cruising is welcome to join SSCA. Whether cruising in home waters, contemplating a sabbatical cruise or retirement afloat, outfitting your boat for a voyage, or already living the dream, all are warmly welcomed to join our family of cruising members. 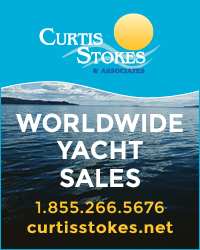 After an initial year of membership, those Associates who have lived aboard their cruising vessel for at least a year, have fulfilled a cruising distance requirement, and who have been sponsored by two current Commodores, may elect to become voting members called Commodores. Commodores fly a red swallowtail burgee with a shield similar to the Associate shield. Are expected to volunteer to help SSCA to remain the vibrant and valuable organization that it is. Acknowledge that all SSCA publications are for the personal use of its members and will not use them otherwise. Agree that violation of the traditions and clean wake motto of the SSCA could cause the non-renewal of membership in accordance with the SSCA bylaws. Common Bond We are a caring and supportive family of kindred spirits: individuals who share a unique lifestyle and who reach out with international friendship, goodwill and camaraderie. We willingly assist a fellow sailor, regardless of which flag his vessel flies. Commitment We live a cruising lifestyle aboard our own ocean-going vessels, which are our homes, and conduct ourselves with independence and responsibility in an honorable and self-reliant manner. As a result, we assure the safety of ourselves and our crew, and the safety, comfort and convenience of vessels nearby. Clean Wake We always leave a clean wake by treating others and our environment with respect and deep regard, so that those who follow in our wake will be welcome. We know and follow maritime rules, including the Rules of the Road, no-discharge zones and waste management. We respect the local laws, customs and beliefs of any country we visit, even when we may feel that others are in the wrong. We are courteous and respectful without compromising our personal standards. Bulletin We share our cruising experiences and information, provide inspiration and advice, and support our traditions through the letters we write. Sponsorship We help new members along the path of cruiserhood, and sponsor those who qualify to be Commodores. Burgee We proudly fly our SSCA burgee and display our shield; find each other in anchorages worldwide; meet, help one another and enjoy the camaraderie. Non-Profit We contribute to our Bulletin and volunteer our time and energy to help SSCA. How do I join SSCA? If you are not a member of SSCA, click here to join. If you have questions or want more information, call SSCA Home Base at 754-702-5068 or email office@ssca.org. $65.00/yr to access the bulletin online and optionally download to your computer. $85.00/yr U.S. First Class delivery to a U.S. address. $95.00/yr for Overseas Mail Delivery. Welcome to the SSCA !